Lancaster III JA851 crashed Hellesø 18/8-1943. The aircraft belonged to RAF 49 Sqn Bomber Command and was coded EA-P.
T/o 21:43 Fiskerton. OP: Penemünde. On the return flight from Penemünde JA851 was shot down by a Bf 110 night fighter operated by Pilot Oberleutnant Hans Meissner and Funker Josef Krinner of 2. / NJG 3 at 4500 metres altitude. At 02:54 hours the Lancaster crashed near Hellesø on the northern part of the island of Als killing all onboard. I hit the ground in a field belonging to Stenbæksgård farm and skidded out into the waters of Als fjord where it disappeared on deep water. It was seen burning for an hour under water. On the beach was found two ailerons while in the field were found what was probably the right hand horizontal stabilizer. In a police report is mentioned the finding of a body in the fields belonging to Stenbækgård and the owner of the farm P. Hejsel tells that he saw the dead flyer and saw that he carried a ribbon of an order. This body was laid to rest in Grave 14, Row 3 in Aabenraa cemetery on 21/9 1943 where he to this day rests as an unknown airman. 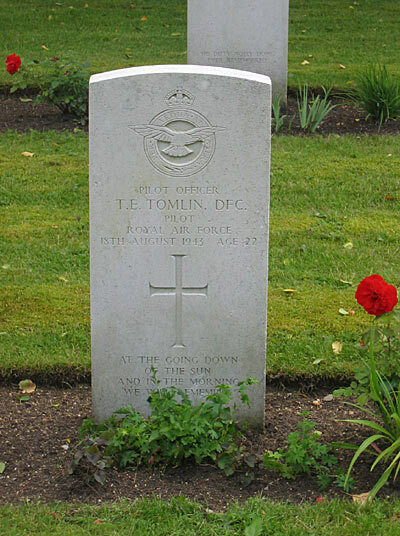 Only Pilot P/O Thomas E. Tomlin DFC have been found and identified. He was found washed ashore on Halk Beach near haderslev on 16/9 and was laid to rest in Aabenraa cemetery on 20/9 1943. The rest of the crew who were Flt Eng. Sgt Kenneth E. Watson, Navigator F/S William J. Rooke RAAF, Air Bomber F/S William A. Davies MID, Air Gnr Sgt Cecil Stancliffe, Air Gnr. F/S Thomas Tonkin DFM and Air Gnr. F/S George B. Silvester DFM have no known grave and are commemorated on the Runnymede Memorial. It should be mentioned that the records from the cemetery in Aabenraa were destroyed by the Germans at the end of was. Today only exist a few pages which had been stolen by a Dane. At the time at the crash only Rear gunner Silvester had been awarded a DFM. Tomlin and Tonkin only received their awards post mortem. The author of this home page therefore assume that the unknown airman actually were Silvester. 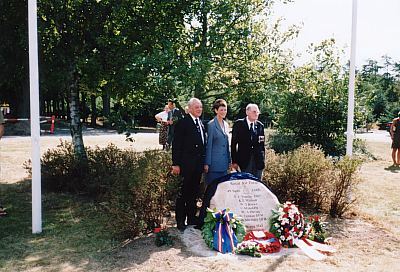 Sources: LBUK, Report Sønderborg police, AS69-154, CWGC, BA, BCL.